^ "Handel" entry in Collins English Dictionary, HarperCollins Publishers, 1998. 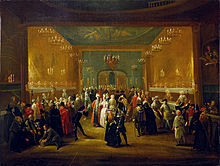 ^ British Citizen by Act of Parliament: George Frideric Handel. Parliament.uk. 14 April 2009 [13 April 2012]. ^ Dean, Winton. Handel and the Opera Seria. University of California Press. 1969: 19. ISBN 978-0520014381. ^ p 239. Handel, a celebration of his life and times, 1685–1759. Jacob Simon, National Portrait Gallery (Great Britain), 1985. Young, Percy Marshall. Handel. New York: David White Company. 1966. Deutsch, Otto Erich. Handel: A Documentary Biography. 1955. Dent, Edward Joseph. Handel. R A Kessinger Publishing. 2004. ISBN 1-4191-2275-4. Keates, Jonathan. 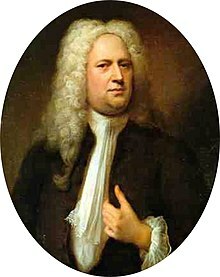 Handel: The Man and His Music. New York: St Martin's Press. 1985. Howell, Ian. How to Handle Spelling Händel. The Countertenor Voice. Howell, Ian. Guiding Handel's Legacy: An Interview with Handel House Museum Director Sarah Bardwell. The Countertenor Voice.